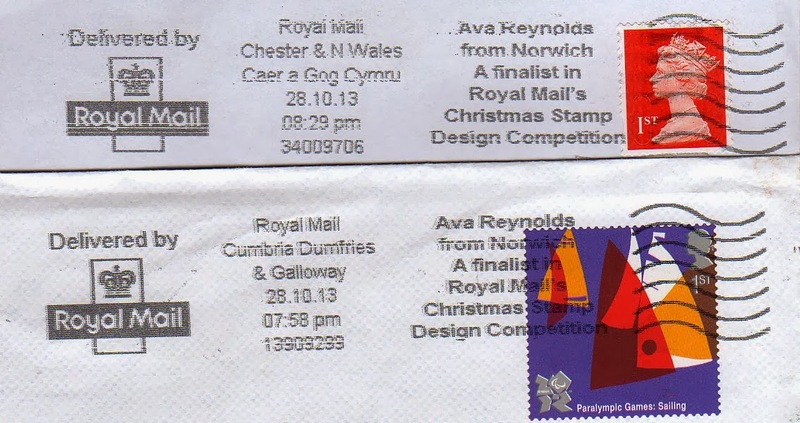 Having used special slogan postmarks for the 11 Doctor Whos, and the 11 Football Legends, Royal Mail has now used similar postmarks for the finalists in their Design a Christmas Stamp Childrens Competition. This is part 2 of the listing; the first part is here. The campaign started on 3 October, with each postmark being in use for one day only (at least that is the plan, but see the detail below), running up to the announcement of the two winners on 31 October, and the issuing of the stamps on 5 November. Latest text additions will be in blue; images will be slotted in more or less in order. I've arranged to have covers sent from Shropshire/Wales for the rest of the campaign and hope to be able to provide examples of all. Here's a better example of that from Cambridge MC - thanks JG! Also from JG, the 22 October Kristina Pavic from Sheffield slogan from Cambridge MC; also seen from North West Midlands MC but date unclear (could be 23rd). and 23 October Thomas Donaldson from Hull also from Cambridge MC. 24 October Daniel Payne from Rainham also from Cambridge MC. 28 October Ava Reynolds from Norwich - Chester and N Wales MC, and Cumbria Dumfries and Galloway MC; also Lancashire and South Lakes MC (delivered a day late). Most of the Cambridge ones thanks to JG. And that completes the series. But if anybody in Wales has any more to show, please send us copies, which will help us to see where they were applied. Not quite the end, as JG has now sent the last Welsh-language ones from Cambridge to Cardiff, copies dated 30 and 31 October and 1 November. We still need to see some from Welsh offices other than Chester. The Fred Egerton postmark, due on 1st November (and 2nd) has been seen in use at North & West Yorkshire on 2nd and 4th, and at North West Midlands on 4th and 8th! Ava Reynolds (Norwich) was in use on 28th AND 29th October at the Nottingham Mail Centre. Great shame for Ethan Mahal as, living in Derby, Nottingham is very close meaning it probably stopped several friends and family from receiving mail displaying his achievement. The Oliver Miller from Oswestry postmark was used 1/11/13 - a day late - by Nottingham Mail Centre (once again!). That's bad luck - but if they were sent to addresses in Wales then that would have been correct - for some reason known only to Royal Mail (I must ask why) mail from all Mail Centres TO Wales had the postmark for the two Welsh girls. Postmarks on mail addressed to England, Scotland and Northern Ireland (and probably abroad) had a different slogan every day (that was the idea anyway). If Oliver would like some letters with 'his' postmark on, please send an email to ian@norphil.co.uk and we will arrange something.